This Smoky Facon Sipping Broth is a peppery blend of smoked sea salt, spices & tea. This first-of-its-kind savory single serve hot beverage delivers an amazing taste using the highest quality vegan, natural, wild harvest, gluten-free ingredients - Vegan, Natural Ingredients & No added MSG. It really is Comfort Food in a Broth™. Comes in an air-tight flexible foil package. The packet is great to keep in your drawer at the office. If you travel, then it is really easy to pack in your baggage, purse or backpack. Or, you can have the packet at home in your tea drawer, or next to your other hot drinks in the cupboard. Facts Serv. Size: 1/2 tsp, Calories 19, Fat Cal 0 Total Fat 0g (0% DV), Sat Fat .0g (0%DV), Trans Fat 0g ,Cholest. 0mg (0%DV), Sodium 260mg (11%DV)Total Carb. 3g (1%DV), Fiber 0g (0%DV), Sugars 0g (0%DV), Protein 0g (0%V), Vitamin A (0%DV), Vitamin C (0%DV) Calcium (0%DV), Iron (0%DV) Percent Daily Values (DV) are based on a 2,000 calorie diet. 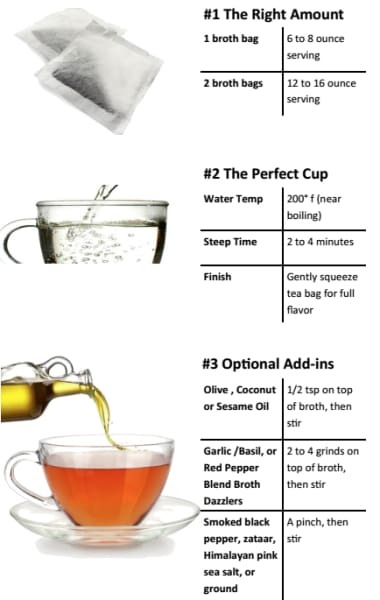 https://store.bariatricpal.com/products/millies-sipping-broth-smoky-facon 28 4.8 1462082306125 Millie's Sipping Broth - Smoky Facon //cdn.shopify.com/s/files/1/0806/1189/products/millies-sipping-broth-smoky-facon-9-pack-brand-diet-stage-maintenance-solid-foods-weight-loss-type-aspartame-free-bariatricpal-store_351.jpg?v=1548103007 //cdn.shopify.com/s/files/1/0806/1189/products/millies-sipping-broth-smoky-facon-9-pack-brand-diet-stage-maintenance-solid-foods-weight-loss-type-aspartame-free-bariatricpal-store_351_large.jpg?v=1548103007 2.99 USD InStock Broth All All Products for Shopping - do not change Aspartame-Free Bariatric Soups, Bouillons & Broths Clear Liquids for your Bariatric Diet Hot Items Millie's Vegetable Sipping Broth Steepables Miscellaneous Miscellaneous New Products Popular Bariatric Foodie Products Soups & Snacks This Smoky Facon Sipping Broth is a peppery blend of smoked sea salt, spices & tea. This first-of-its-kind savory single serve hot beverage delivers an amazing taste using the highest quality vegan, natural, wild harvest, gluten-free ingredients - Vegan, Natural Ingredients & No added MSG. It really is Comfort Food in a Broth™.